The Titanfall website has been updated with a detailed explanation on Burn Cards and how they work. 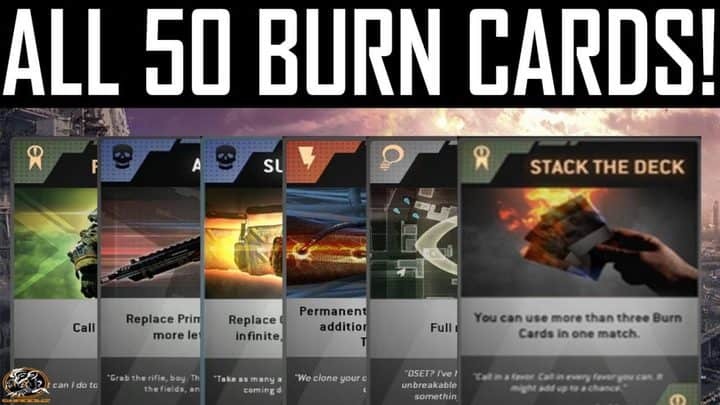 These burn cards did not show up in the previously reported leaks which suggested 50 burn cards would exist in the game – we can only assume the figure is now 52 or more. So what are Burn Cards within Titanfall? Burn Cards are a feature that will temporarily give Pilots special abilities ranging from Amped Weapons, Ability Boosts, Titan Upgrades and much more that begin to unlock once they progress to level 7. As players continue to dominate within the many different game modes and level their Pilots, they will progressively unlock and be able to utilize a total of three Burn Card slots. Once players unlock the Burn Card feature, they will be able to access the Burn Card menu option from the main menu or in-game lobby and choose which Burn Cards they would like to equip. Remember to select and activate a Burn Card before the start of every match. You can also select and activate a Burn Card after you die. In both cases, the Burn Card will take effect when you respawn. Within each match Pilots will have access to three Burn Cards, so choose your cards wisely. Each Burn Card perk will last one Pilot life, but the effect or upgrade will persist across multiple rounds during round-base game modes, like Last Titan Standing. Players will only be able to carry a limited number of Burn Cards, so once their collection is full, they will have the option to discard or use several Burn Cards in the next round in order to earn more. If your Burn Card collection is full, you will be unable to gain access to new unlocked cards, and they will automatically be discarded. It is key, to manage your collection at all times. To earn more Burn Cards look to the many challenges within Titanfall, as many of them will reward new cards once completed. The game will offer Pilots multiple types of Burn Cards. Players should remember to keep an eye on their collection, before maxing out and or discarding cards! 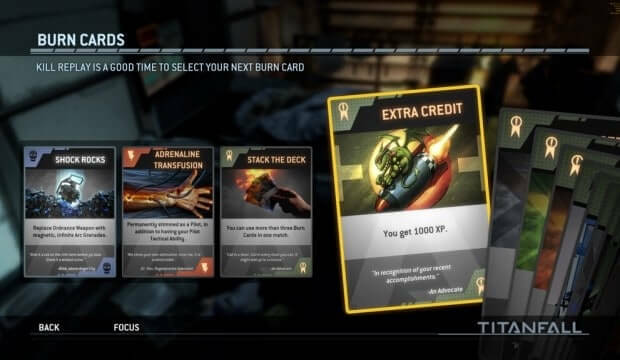 For example, the card “Titan Salvage” is a great Burn Card to bring in the game mode Last Titan Standing because it gives the player more XP for fighting Titans. Or the card “Adrenaline Transfusion” would be a smart boost in Capture the Flag because the constant, high-speed movement reduces the amount of time it would take to run across the map. Burn Cards can only be obtained by playing Titanfall and progressing your Pilot’s level and completing Challenges. Players will not be able to trade Burn Cards with other players and they will not be offered for purchase via microtransactions. Visit the official website to see the burns card section in full.